Cricket has always been a special game, full of joy, surprises and competition. It is the most played game in India by youth than any other game. Every other person is involved in this game in one and another way. We as Indians not just love cricket but live cricket. How easily we do say it is a matter of life or death if we win or lose particular match against our rivalry cricket opponents, but we never mean to be so vicious to take spine out of their throat in real just to show the dominance over game. It is just a saying but we never thought how fatal it can be proved in an unfortunate incident that recently occurred on playground. Philip Hughes a young man representing his team playing his beloved game, an unstoppable talent of winning hearts of people in or out of the field became the victim in the most unlikely incident that ever happened in cricket. Everyone who know him expect how well he is going to build his later life while contemplating his passion the way he has built so far. He was the person with great expectations, future of Australian cricket, and a bright side to look for. Going through his early life videos and clip showed how good at humor, positive at attitude and how mature he was with everyone. Making everyone laugh who was there by his side and playing jokes just showed how full of life Hughesy was and how much his mates loved him by all their hearts. My heart cries for the unfortunate incident that took place, and took one of the finest person, sportsman, brother, son, teammate, A young talent away from us. People spend their life doing what they love they sometimes also wish to die for same thing they love. Philip Hughes died doing what he loved, left behind a saga of a complete inning, he may got knocked out but he will always remain not out. Cricket will never be the same with batsman to be more serious or concern what worse can the next ball can bring to him and bowlers to be more cautious at the instant when their hands leave the ball at a furious speed towards batsman. 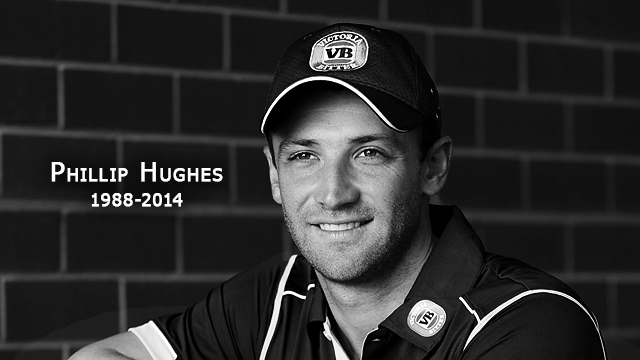 Rest in Peace Philip Hughes. May his family, team members, and every other person related to cricket get courage to handle the sad demise of young athlete Philip. May cricket be more safe and no more such incident take place on ground in future not even a little injury.